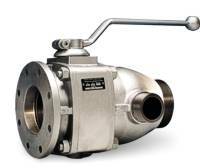 Prokosch 470-series ball valves use fewer individual parts, have space-saving elements, are based on a practical modular principle and are easy to switch. The free cylindrical pass reduces flow resistance to a minimum and the dual-sided bearing configuration of the ball ensures a uniformly low switching torque throughout the entire pressure region. Nominal size 80 and 100 available in material combinations 2, 4, 7 and 9. "PTFE/O-ring spring-mounted" design with strong seal system, developed specifically for use with powdered and granular goods. "FA" design with aerodynamic jam-free discharge flange for use with media that easily clog the fitting. Special designs regarding material and design are available upon request.